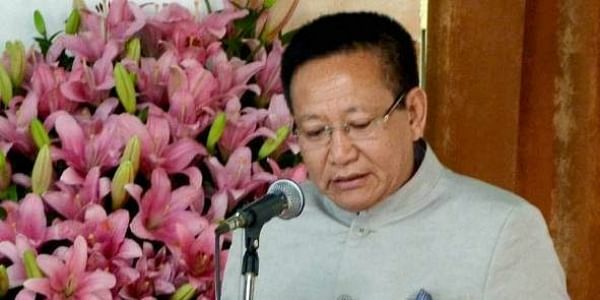 Zeliang first donned the mantle of CM in 2014 when Neiphiu Rio who was chief minister at the time had resigned to contest in the Lok Sabha elections. GUWAHATI: In a dramatic turn of events, Nagaland Governor PB Acharya on Wednesday dismissed chief minister Shurhozelie Liezietsu and appointed T R Zeliang, who was leading a group of dissident Naga People’s Front (NPF) MLAs, as the state’s next CM. Zeliang was administered the oath of office and secrecy by governor Acharya at 3.00 pm during a function held in Raj Bhawan in Kohima. MLAs — 36 of them from the Naga People’s Front (NPF), seven Independents and four BJP MLAs — in the 60 member House, which now has an effective strength of 59, following Liezietsu’s son Khriehu Liezietsu’s resignation, last month. Former chief minister Liezietsu was supposed to take a floor test on Wednesday at 9.30 am to prove his majority. However, he and 11 other MLAs boycotted the process and the House had to be adjourned sine dine. Following this, the speaker of the House sent a report to governor Acharya. Subsequently, the governor sent an order to the chief minister, dismissing him. Meanwhile, Liezietsu had filed a petition at a Division Bench of the Gauhati High Court, challenging the dismissal of his writ petition by the Kohima Bench of the Gauhati HC. Rio, whose NPF is a constituent of National Democratic Alliance (NDA), contested and won the 2014 Lok Sabha polls. However, when the ruling BJP refused to make him a Union minister, he tried make a comeback to Nagaland politics. He allegedly made two unsuccessful attempts to oust Zeliang. However, recently the two buried the hatchet and joined hands to plot Liezietsu’s fall. It remains unclear how the tribal organisations would respond to his government. It was their protests against 33 per cent reservation for women in civic elections that led to Zeliang’s resignation in February. Rio, the three-time former chief minister may try to make good use of any protest against Zeliang to reclaim seat of chief minister. With nine months left for Nagaland Assembly elections, Zeliang’s maiden challenge will be induction of MLAs into his ministry. He has got a long list of MLAs to chose from while allotting ministerial posts. He can at best induct 12 MLAs. But there are independents, MLAs from the camp of former CM Neiphiu Rio, legislators from the BJP, and the NPF. “Money, as well as power, plays a big role in the politics of Nagaland. With elections just months away, most MLAs would surely demand their pound of flesh,” a Naga politician told the New Indian Express.